Chemical Engineering Volume 2 covers the properties of particulate systems, including the character of individual particles and their behaviour in fluids. Sedimentation of particles, both singly and at high concentrations, flow in packed and fluidised beads and filtration are then examined. 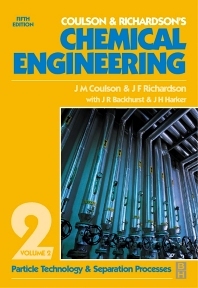 The latter part of the book deals with separation processes, such as distillation and gas absorption, which illustrate applications of the fundamental principles of mass transfer introduced in Chemical Engineering Volume 1. In conclusion, several techniques of growing importance - adsorption, ion exchange, chromatographic and membrane separations, and process intensification - are described.